The 500-Metre Tops of Ireland are the Irish hills at or above 500m and below 609.6m (2,000ft) in height that have a minimum drop of 30m. The list is co-authored by Michael Dewey and Myrddyn Phillips with each having produced a version of the list independent of the other. Michael’s list originated in 1998 and comprised 186 hills, whilst Myrddyn’s list originated in 2000 and comprised 191 hills with a further 29 hills listed in a sub list entitled ‘Hills that need on the spot surveying with the prospect of being future additions’, this sub list forms the basis of the 500m Subs that now accompanies the main P30 list. The list produced by Myrddyn was sent to a number of people including Michael Dewey and the Mountaineering Council of Ireland (now named Mountaineering Ireland). Having produced versions of the same list the two authors combined each and decided to produce one co-authored list. Data were re-evaluated and the updated co-authored list was sent to the Mountaineering Council of Ireland and later formed the lower height band of the list that appeared on the fledging MountainViews website in 2002, this list was later named the Arderins in 2009, with the higher height band of this list using data from the late Joss Lynam’s 600m Irish list. The 500-Metre Tops of Ireland listing was next fully re-evaluated with assistance from Jim Bloomer prior to it being published on the Hill Bagging website on 1st June 2011, and it was then published in the downloadable Access and Excel versions (v12.0) of the Database of British and Irish Hills (DoBIH) on 27th November 2011. During this process the original sub list was also fully re-evaluated and appeared in the Hill Bagging publication entitled subMyrddynDewey, this sub list is referred to as the 500m Subs in the Change Registers published on Mapping Mountains. However, it wasn’t until the Hill Bagging publication and the subsequent Database of British and Irish Hills (DoBIH) publication that the listing included two other sub categories; the 490m Subs and the 490m Double Subs and this Change Register details those hills that are, or have been listed within the 490m Subs category. These two sub categories are not officially tied to The 500-Metre Tops of Ireland list on either the Hill Bagging or the DoBIH publication, but these data were sourced from The 400-Metre Tops of Ireland list compiled by Myrddyn Phillips and subsequently duplicated by MountainViews and renamed The Carns. As these data are officially a part of The 500-Metre Tops of Ireland list, the hills incorporated are documented in this Change Register. The 490m Subs comprise all Irish hills that fail to meet The 500-Metre Tops of Ireland qualification by 10m or less of height, these are the hills that are 490m or more and below 500m in height that have a minimum 30m of drop. Although the criteria has remained the same The 500-Metre Tops of Ireland list has changed greatly since its first publication with the advent of independent surveyors enabling greater accuracy for numerical data, and the meticulous research conducted by Paul Tempan and incorporated by MountainViews, the listing also now incorporates three Sub categories, the 500m Subs, the 490m Subs which this Change Register details and the 490m Double Subs. It seems fitting that the list of The 500-Metre Tops of Ireland – 490m Subs should now benefit from a detailed Change Register, and although the compilation to this sub list took place when the data were re-evaluated prior to publication on the Hill Bagging website in 2011, it is prudent for this Change Register to initially detail the changes to the list since this publication. 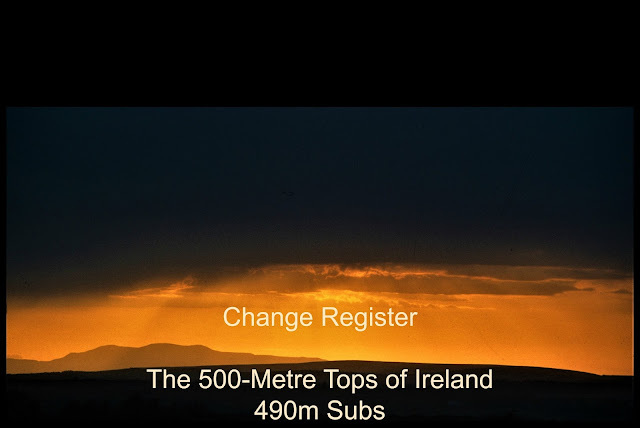 The Change Register to The 500-Metre Tops of Ireland – 490m Subs appears below with the reclassifications to the list being detailed chronologically in receding order. As of yet there are no reclassifications to this sub list since June 2011 publication by Hill Bagging. 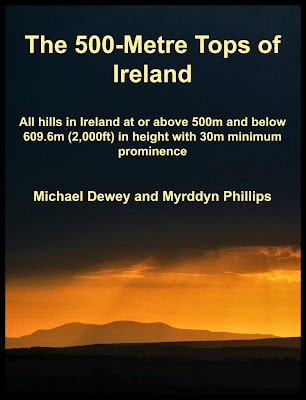 27th November 2011 – Database of British and Irish Hills publishes The 500-Metre Tops of Ireland. The 500-Metre Tops of Ireland – 490m Subs total confirmed as 22. 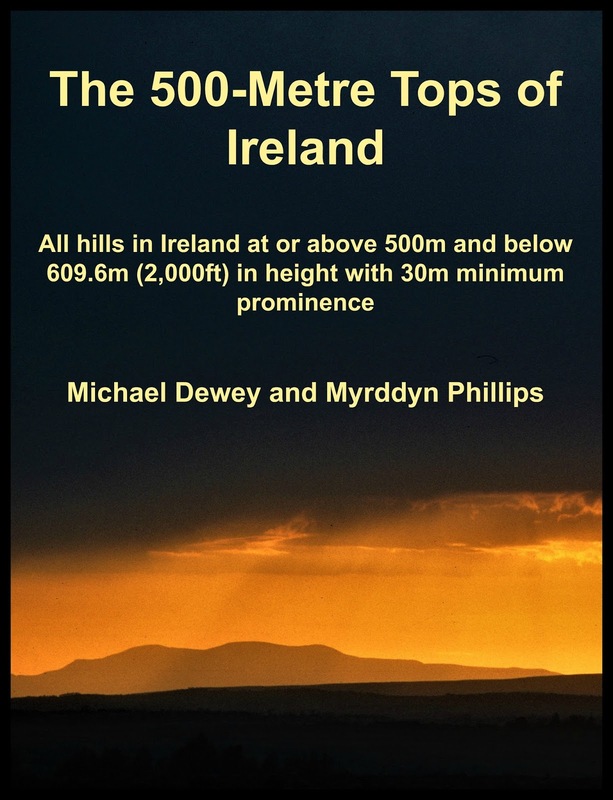 1st June 2011 – Hill Bagging publishes The 500-Metre Tops of Ireland.